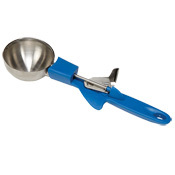 This 8 oz disher is only available from Cook's Correctional! Cook's worked with their correctional foodservice customers to create an extra-large disher that was also extremely durable. It's great for controlling portion sizes in a commercial or institutional kitchen or for an extra-large scoop of ice cream at home. This was the only 8oz disher I could find online. Easy to handle and comfortable. I have looked every where to replace an old 8 oz disher with no luck.Until I was told about Cooks Source.I found the product and ordered and in no time recieved my disher.Its been a life saver here in the institution facility.Thanks Cooks I will be ordering more items in the future. I searched the net for a 1-cup scoop with trigger release, I could only find it at Cook's. After receiving it, there was a manufacturer's defect that was irritating but I decided to live with it. Until a Cook's rep followed up with an email a few days later and I told her about it. A new scoop in perfect working order arrived a couple days later, no questions asked. You don't see that level of service these days. I will definitely shop here in the future. Thanks again! We love this disher! It is the perfect size that we had been looking for for a long time. We use it to portion our home made dog food at www.freshwholefoodfordogs.com. It is heavy-duty, easy to use, easy to clean. We bought two!